You are currently browsing the tag archive for the ‘ANA-airlines’ tag. Woo-Hoo! I’m back to writing regular entries on this blog again. I just recently arrived in Tokyo, Japan (yesterday) with my husband. My traveling companion & I will be in Tokyo for one week before we jet off to China for another week. We had originally planned to use this vacation time as our fun time…but alas…we have some serious family matters to take care of while we are traveling, so this is going to be one heck of a ride folks! 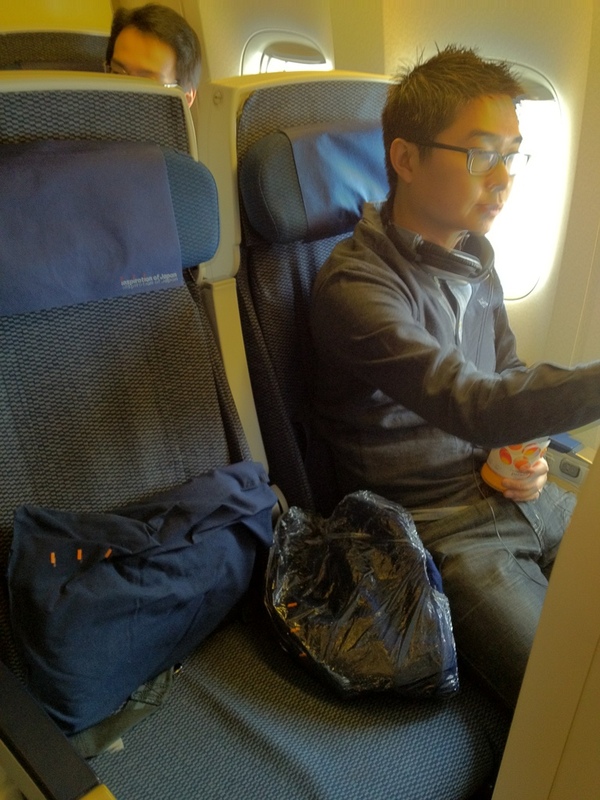 The first thing I want to say is: HOW COME I’VE NEVER FLOWN ON ANA EVERY SINGLE TIME BEFORE NOW??! Every other time we have traveled to Tokyo, we’ve always flown via United Airlines. It’s not the worst airline we’ve ever flown on, but it’s at least the most basic to get us to our destination. Then, when we flew on ANA this time around, we were so blown away by how awesome the airline was! The service was great, our seats were comfortable & (with the help of our own noise-cancelling headphones) we had a relatively no-screaming-kids flight. 1. The seats were very comfortable with plenty of leg room, even for a 6 foot tall person. When the seats recline, only the bottom seat-cushion and back cushion slide down & forward…so the back rest doesn’t push backwards & obstruct the space of the person sitting behind you. Also, the headrest adjusts up & down for comfort. 3. 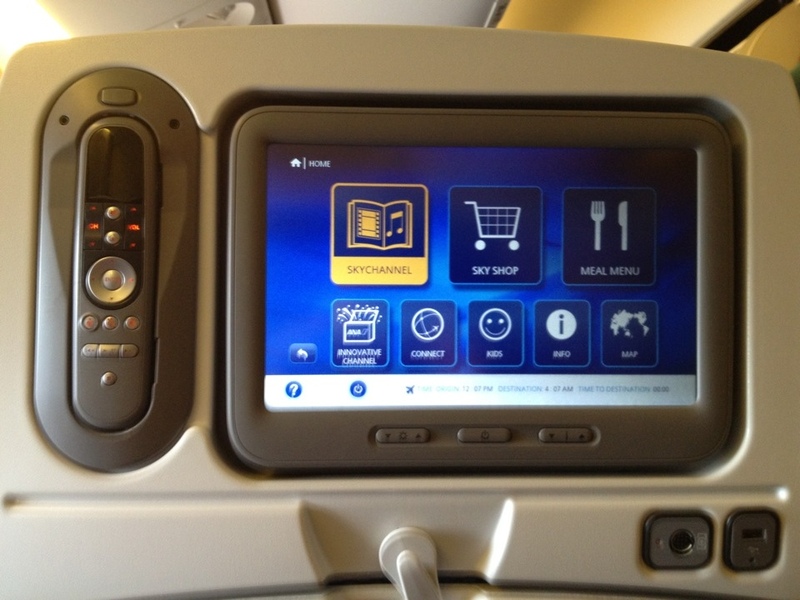 Each seat has its own interactive TV screen, which you can watch various videos, movies &/or listen to music. There is also a USB connector, so you can plug in your MP3 player & listen to your own music. Also, the movie selection was really good. There were about 12 or so movies to choose from, so you don’t have to watch the same Disney channel kids movie on repeat while on a long flight. The only downside is you can’t adjust/swivel the TV screen, so if you want to prop your head to the side, you will get an annoying glare from the screen’s privacy coating. 4. Our in-flight meals didn’t taste like cardboard or mush. They actually tasted pretty decent. 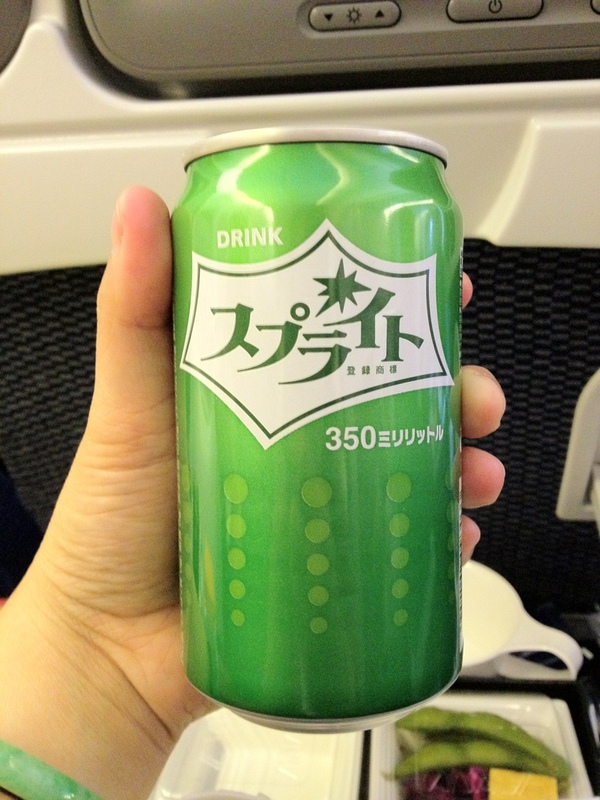 My husband was pleasantly surprised to find that ANA serves Suntory the Premium Malts beer on the flight…not just the usual Asahi or Sapporo. Also, did I mention there was a handy cup holder for your drinks? 5. 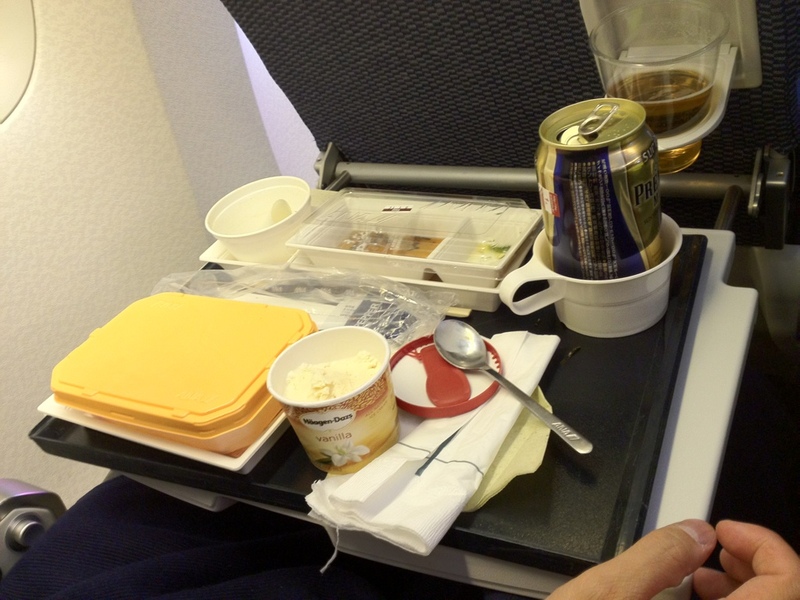 One of the best moments of our flight…right after they served the first (& the main) meal, the flight attendants came around & served Häagen Dazs ice cream to all of us. As some of you may or may not know, Häagen Dazs is my all-time favorite brand of ice cream. Like. Ever. 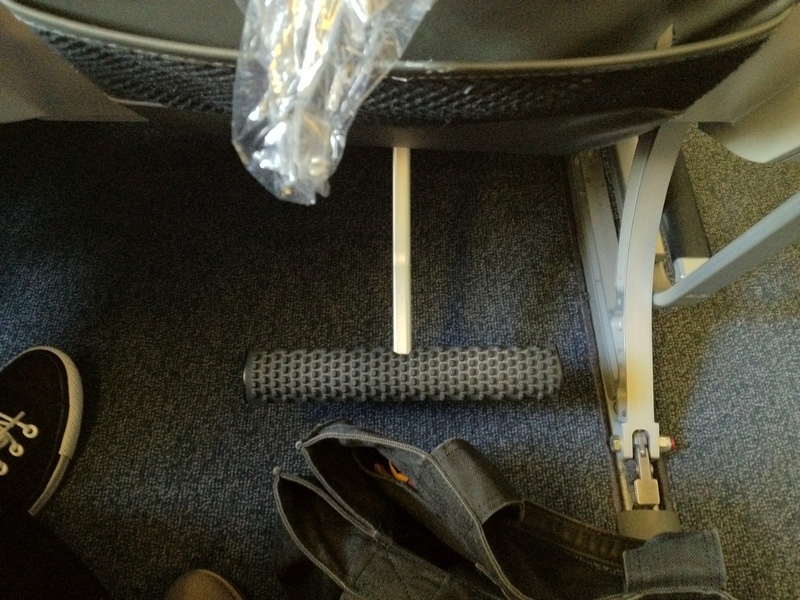 That pretty much sums up our awesome in-flight experience. I’d love to post a blog entry each day about my goings-on in Tokyo while I’m here, but I think I’ll just stick to posting just the highlights… maybe a few highlights of each day. Until then, I’ll leave you with 2 random pictures for now. Can you guess what brand of soda this is?? If you guessed SPRITE, then you’re correct! 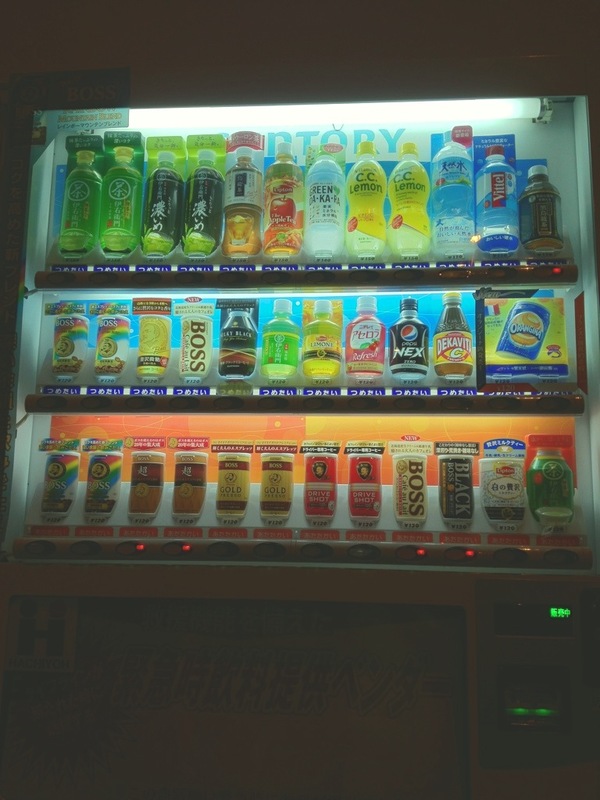 The legendary vending machine(s) of Japan. This one dispenses both hot & cold drinks. Yes, I said HOT & COLD. The drinks marked in blue are cold. The drinks marked in red are hot…& yes, they do come out HOT, not lukewarm. Perfect for the chilly morning weather!